All Lacoste homes currently listed for sale in Lacoste as of 04/23/2019 are shown below. You can change the search criteria at any time by pressing the 'Change Search' button below. If you have any questions or you would like more information about any Lacoste homes for sale or other Lacoste real estate, please contact us and one of our knowledgeable Lacoste REALTORS® would be pleased to assist you. "2013 constructed 2/1 appx. 1400 sq. ft. home w/ 2 400 sq. ft. front & rear covered porches. The home is plumbed for a 2nd bath. 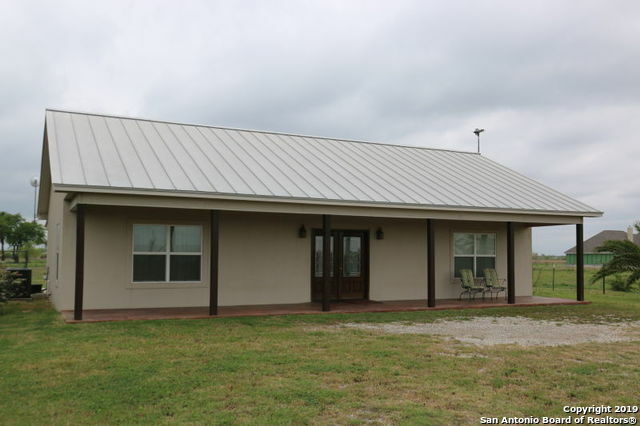 This property includes 1.45 acres, a 1600 sq. ft. commercial shop with an 840 sq. ft. awning. The shop was originally designed for a drive thru store & has three 14' rollup doors and appx 20 ft. ceilings. Also contains an office & 1/2 bath. This could be an ideal location for the car hobbyist with home or as commercial business. Many uses. Also mature Live Oaks, Palm t"
"Live in the Country near Castroville!! New 3/2/1 with an oversized 2 car garage. 9' plate heights, solar decking, 30 yr. shingle roof, 100% stucco exterior, wood look porcelain tile, custom cabinets, granite countertops throughout, walk in shower, garden tub to soak those aches, SS steel appliances, large, covered rear patio w fan to enjoy those wonderful sunsets, excellent soil, flat lot, few rocks, large kitchen sink, walk in closets in all bedrooms, vinyl window frames, 10 yr. warranty and mo"